Selection for the International Hall of Fame requires the affirmative vote of at least six of the nine members of the Selection Committee. A maximum of seven individuals can be elected in each two-year period. 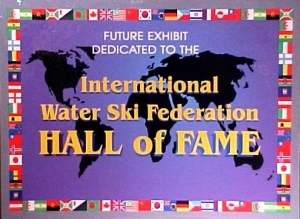 For a skier to be eligible for consideration he/she must have competed in at least two World Championships and must have been retired from Open competition for at least two additional World Championships. The primary considerations in voting for a skier are his/her skiing record in the World Championships, World records set, sportsmanship, character and integrity. The submission of Nominations is open to all so that all Disciplines have an equal opportunity. The only proviso is that each is approved by their own IWWF Federation. Candidates may be put forward as Athletes, Officials or Pioneers. By clicking on the on-line Nomination Forms, a guide is given on what is required for each submission. Each Form should be fully completed to do full justice to the candidates. Please do not click SUBMIT NOMINATION at the end of each Form till it has been fully completed as each goes immediately to our central collection point. Incomplete Forms will invalidate the submission. Frank Harrison, Richard Gray, Arturo Torres, Juergen Pitz, Stefan Rauchenwald, Chantal Amade-Escot, Glenn Thurlow, Steve Cockeram and Bruce Cockburn.